Whether they’ve been practicing for three months or three decades, therapists are continuously honing their craft. But much of what we learn through trial and error, and hours upon hours sitting across from clients, we were never taught in grad school. So we asked some seasoned therapists to pass on the lessons they wish someone had told them when they were first starting out. I don’t think we do a good enough job of teaching clients about the value of closure in therapy. We’re ghosted by our clients all the time, meaning they simply disappear. They leave therapy just like they’d leave a supermarket or a hairdresser. A lot of therapists will complain about clients who suddenly disappear for some reason, and that’s on us. It’s on us to talk to clients about their goals, and how they envision therapy ending. Therapy can be the place where many people have a truly good, clean ending with great closure, and they don’t get that often in other aspects of their lives. Many of us don’t talk about the end of therapy because we fear a shrinking caseload, or because we have our own fear of loss. We want to deny that there’s an end phase too. This might be a little startling for some people to recognize, but it’s very helpful in that it gives clients a path to follow. So we need to pay attention to the end of therapy from the very beginning. One of the secrets of good therapy is allowing clients to speak for themselves and respond to our interventions. It’s an important step in helping them craft a self-image. Early on in my career, I was working with a client who was unbelievably self-defeating, and it made me visibly angry. I felt so guilty about it afterward and was pretty sure she wouldn’t show up for her next session. But she did, and to my utter shock, she expressed how much she appreciated that I cared about her—she’d interpreted my frustration as caring. So when I’m training my students, I tell them that they have to find out how their clients interpreted their work. In my practice, I’ll ask what clients thought about how I responded to their problem. If I’ve made a mistake, I’ll apologize. What I’ve found my clients appreciate most of all isn’t what specific intervention I used, but that I took the time to listen to them. Understanding that I don’t have to stick to one clinical orientation—that I’m going to change over the course of my career—is so important. Many therapists have the mentality that after they get licensed and pass their exams, they’ve arrived. But the truth is we never stop learning, and we always need to be flexible in using the wide variety of tools at our disposal, even if we specialize in, say, CBT or ACT. Some clients might want constant homework and accountability, and a quantitative system where you’re measuring progress and working toward concrete goals. Other clients might say, “Are you kidding me? Homework? That sounds miserable.” You have to stay on your toes. I recently worked with a client who had social anxiety. My immediate thought was to get him acclimated to social situations between sessions. But since he was also committing several hours a day to caring for an elderly relative, I realized this wasn’t feasible. So what was the best option? I needed to reformulate how I was going to do things. In the end, I decided on having him take smaller steps to alleviate social anxiety, like talking to a stranger in the elevator. As a younger therapist, the passion you feel for certain interventions after seeing them work so beautifully in certain contexts can blind you to the fact that they sometimes need to be adjusted. It’s important to know who you are as a therapist and a person: to know your strengths and weaknesses and that it’s okay that not everyone will like you. We can’t be everything to everybody. When you first start out, there’s this tendency to think, I really have to bend and mold myself so my clients like me. Realizing that you can’t connect with everyone and being confident in who you are is a big part of growing as a therapist. By doing this, you can accurately present yourself to clients. In fact, when most clients call to make appointments, the first thing they say is “Tell me about yourself” or “Tell me about your practice” or “What kind of therapy do you do?” I think it’s important to be able to respond honestly. Not every client is going to be a great fit for me, and that’s fine. My therapist colleagues and I are all very different, and thanks to this, I can make sure clients are working with the right person. Burnout and compassion fatigue are real, and we don’t talk about it enough. The therapist is the main tool in therapy, so we need to take care of ourselves and constantly monitor how we’re feeling. If we’re not focused or present in the room, we’re losing the sense of safety and holding that’s the magic of therapy. It’s okay to take time off. It’s okay to scale back your hours. I recently worked with a client who was dealing with some severe depression issues and was particularly challenging. Since it took a lot of energy and focus to be present with him at times, I intentionally booked a block after my sessions with him so I could take a walk, debrief with a colleague, or practice some mindfulness breathing to reground myself. On a larger scope, I try to take care of myself through proper nutrition, regular exercise, and spending time with friends. It seems basic, but it’s easy to let this slip from our routines—and it can mean the difference between our capacity to help our clients or not. We’re not superheroes. We need to acknowledge that we all have limits, and within these limits, we need to always expect the unexpected and be flexible, so we’re not thrown by them. Once I had a client who was in the middle of a telling me about her marriage when she suddenly reached over and touched my foot. I’d been wearing open-toed shoes that day. “Oh, cute toes!” she exclaimed. It kind of threw me off, but these unexpected things happen in therapy all the time, and you have to get comfortable with that. 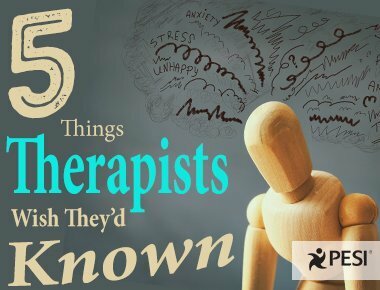 The therapist comments in your post: 5 Things Seasoned Therapists Wish They'd Known, were very helpful. Thank you. Chris, I agree completely! Thank you for asking the question, and putting this together. I have forwarded this to the wonderful young supervises I mentor with who are working toward licensure. These are Most Definitely points we discuss over time. Thank you! M.Ed., MSW, LCSW, CAP, QS 25+ years in the field - various populations.